Lately the shipwrecks in the deeper waters have been yielding some large predators. Lemon Sharks and Bull Sharks are often hunting around these submerged structures. These feisty hunters are also found in the back country flats around Key West. 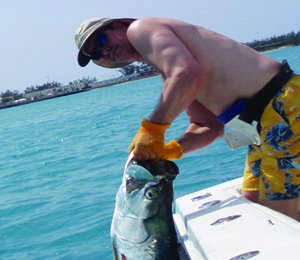 In the Gulf of Mexico our charters have been snagging ample Grouper and Snapper. You may even have an opportunity to catch a huge Jewfish, also referred to as the Goliath Grouper. These fish are often found hiding amongst the structure of wrecks. If you are interested in hauling in a trophy Tarpon that are famous in the waters around the Florida Keys, be sure to book a charter with us soon. The best season for Tarpon will only last a few more weeks.